Cutting Diagrams Optimized to Save You Money. 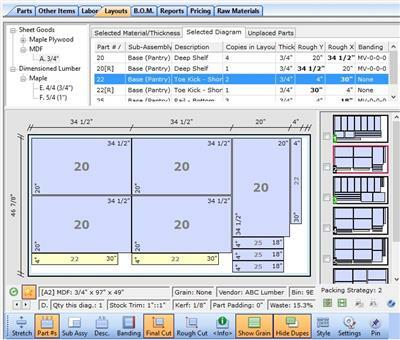 With CutList Plus fx on your PC, you can optimize layouts for plywood, lumber and other sheet materials. Free iPhone, iPad and Android viewer apps included! Easily create the layout diagrams you need. CutList Plus fx quickly generates optimized sheet layouts that make the most efficient use of your plywood panels and lumber. Calculate exactly how much material to buy for your project, and what it will cost.